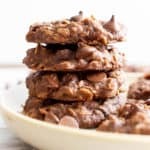 Chocolate Almond Butter Pretzel Bites (V+GF): an easy 3 ingredient recipe for a sweet snack packed full of protein and chocolate flavor. Vegan and Gluten Free. Do you ever get hit with a HUGE craving for snacks? Like, if you don’t get to snack this instant, you’ll go rabid bear on someone and their camping cooler full of goodies? Show of hands? I see your hand and I throw it a high-five. ‘Cause… that’s me. All the time. Yeah, I’m hungry and I’m not ashamed. It’s a sign of vitality, uh… or something. Let’s not think too much about that one. In any case, with my “condition,” I’m always on the hunt for snacks. And since I’m not made of moola, or have a super fantastical snack vending machine in my living room (WOW), I’m always cooking up ideas for snacks. Especially ones I don’t feel guilty about. In college, this constant need for snacks put me in some… erm, interesting positions. I really didn’t understand the people I hung out with. They could go for like 8 hours without eating. Like, seriously? To this day I still can’t believe it. Anywho, oftentimes, I’d be napping studying at the library, barely able to focus on all of that super tiny font, high brow academic babble about… stuff (official college term). My eyes would be wandering around the library, searching for something interesting. My friends would be off, I dunno, not eating somewhere. And there I was, trying to plump up my backpack, doing my best to will it into a fluffy, nap-worthy travel pillow. My only saving grace was snacks. Oh, the snacks! Honestly, what is college without snacks, coffee and the occasional libation? Okay, but here’s the thing. Truth time: you couldn’t eat in the library. What the?!? I know, I know. This isn’t news. This isn’t even old news. But folks were hungry. And folks really didn’t want to sit in that one smelly area with all of the rabid bear (not me) snack-crazed people who were just goofing off in the food-allowed area. Ahem. I was, you know, serious about studying… not snacking! So what did I do, you ask? I energetically packed all of my snacks in my backpack/travel pillow. I made sure to pack each little grouping in quiet, low-rustling baggies. In the library, in between napping—I mean studying—I would elegantly open up my backpack. I’d rustle some important-looking papers, then casually duck my head into my backpack and quickly stuff my mouth full of snacks. Because. I’m a rabid bear, apparently. Literally, one time (or more, I don’t like to recall), a friend would walk by, all ready to chat. Not hungry at all, of course. Said friend would walk up to me, whilst my head was in my snackpack, start asking all kinds of highly unnecessary questions requiring highly unnecessary elaborate responses, and I’d be like… a straight-up chipmunk with its cheeks full of acorns. And just as attractive. Obviously. Needless to say, there were occasions where I just could not hold it in, and I burst out laughing. The clean up was not cute. This is why I do not recommend doing this. Ever. Because I’ve already embarrassed myself enough for the two of us. Don’t you think? And needless to say, people learned to never approach the crazy lady me at the library. Like ever. The moral of this story? 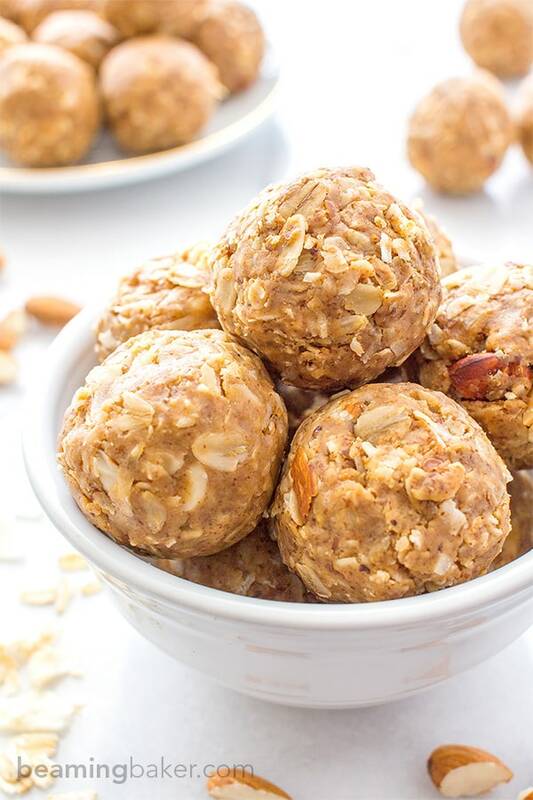 Enjoy these chocolate almond butter pretzel bites outside of the no-food library zones. OUTSIDE. Eat them joyously, freely and proudly in eating-appropriate areas. And just leave all of the embarrassing stuff to me. 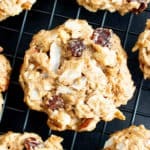 Side note, how great would these snacks be using some of this Whipped Homemade Almond Butter from Food Faith Fitness. Just be sure to swap the honey for maple syrup to make it vegan. Also, I’m finding myself going all googly-eyed over this sunbutter mousse (no-bake, kid-approved) recipe from Allergylicious! Yep, they’re totally calling to the kid in me! This recipe is about as easy as it gets. Enjoy! Line a large baking sheet with wax paper, parchment paper or greased foil. Lay half of the pretzels out on the prepared sheet, evenly spaced apart. Clear space in the freezer for the sheet. 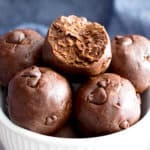 Two methods for making filling: Use the double boiler method or the microwave method. For the microwave method: in a medium, microwave safe bowl, add chocolate chips and almond butter. Place in the microwave and heat for 30 seconds. Stir. Heat again in 20-30 second increments until the chocolate chips are just softened. Be careful not to overheat. Remove from the microwave and stir until smooth and well incorporated. 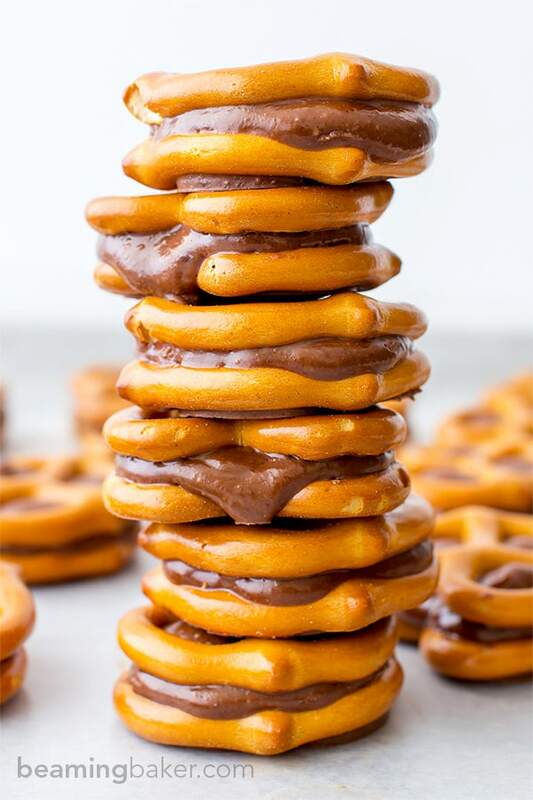 Using a small spoon, scoop the chocolate almond butter mixture onto one pretzel. Drop enough mixture to fill in the pretzel. The more you scoop, the thicker the filling will be. I like to add just enough for a thick filling, but not so much that there’s overflow. Using the remaining pretzels, place one pretzel over the filling. Press down lightly to make a pretzel bite. 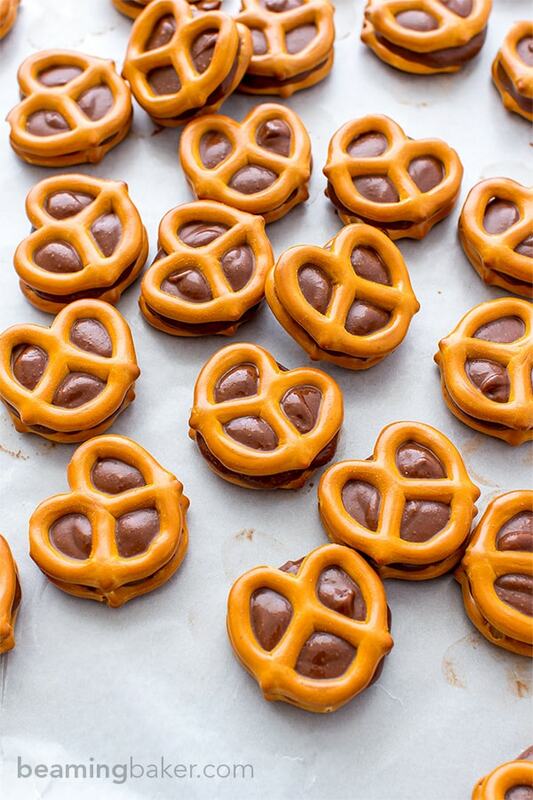 Repeat until you’ve made all of the pretzel bites. Place the sheet into your freezer for 1 hour. Remove from the freezer. Enjoy! - Store in an airtight container in the refrigerator for 1-2 weeks. - Room temperature storage: the pretzel bites will be slightly soft, but still portable. Wrap in wax paper, parchment or plastic, then pack in a hard container to bring it on the go. - Store in the freezer for 3-4 weeks. 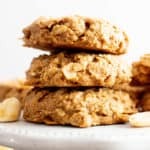 Almond Butter Lovers alert: you’ll love my No Bake Almond Butter Coconut Bites (Vegan, Gluten Free). So easy to make and simply delicious. You’re just 10 minutes away from glazed, crunchy snacktastic goodness. 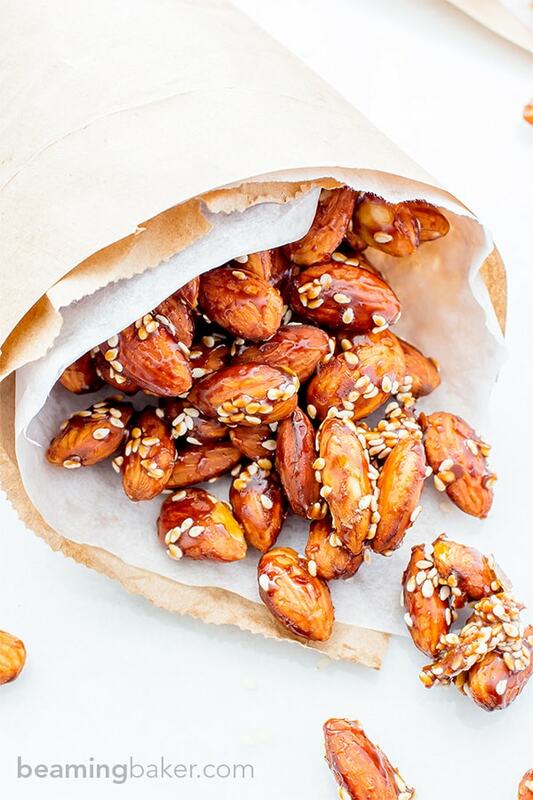 Try my Maple Sesame Almonds (Vegan, Gluten Free). What’s your most embarrassing snack attack story? Oh dear lord…..I almost can’t believe my eyes, these look incredible (and they’re vegan too! )….these are going on my ‘bake-list’ for the weekend! Droooling! Haha – yay for “quiet, low-rustling baggies” and backpacks that are big enough to double as snack-eating machines of sorts and yay for pretzels with AB and chocolate oozing out of ’em! 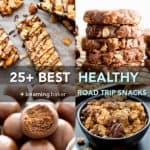 Demeter, I’m trying to snack less – but with glorious snacks like these, I’m thinking I just need to skip out on my meals altogether – I mean, 3 a day are highly over-rated right?! I definitely get ginormous cravings for snacks all the time! Especially the sweet and salty ones. These pretzels are practically jumping off the page at me! I mean, just three ingredients?! LOVE!! You really can’t get much easier (or more delicious) than this. 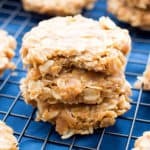 I’ve made a similar version before with peanut butter and powdered sugar, but this sounds SO good with almond butter. Definitely pinning these babies! Hope you have a wonderful weekend, friend! WOW! Amazing clicks. Love that its vegan and looks super delicious. Added in my to do list 🙂 But wish i could grab few right now. Thank you for such a lovely share. Can’t wait to see what you think of these Kushi! 🙂 Thanks, friend! I’m with you! I could never go 8 hours without eating. No way. 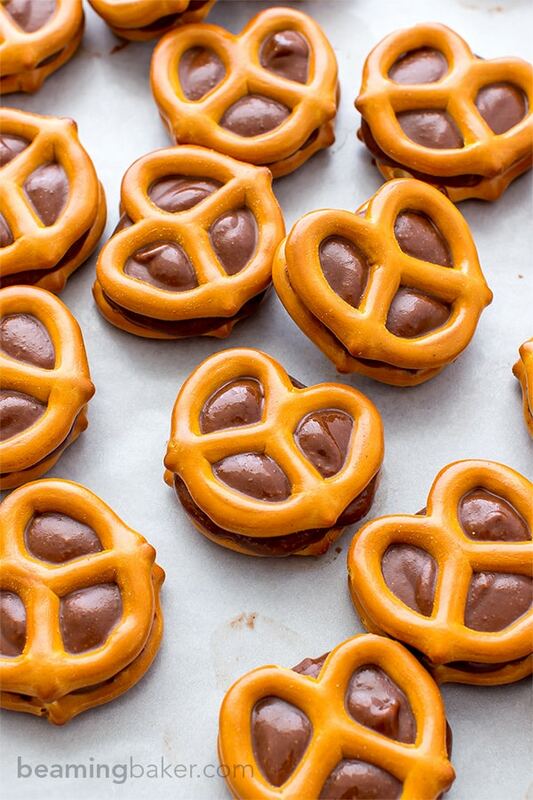 If we were in the same library we would both have our head in our backpacks, munching on these amazing chocolate almond butter pretzel bites. 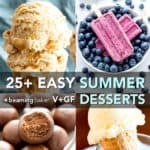 Love them, already pinned, so easy and fast to make, perfect for my sweet cravings (and I have them all the time 😉 ). 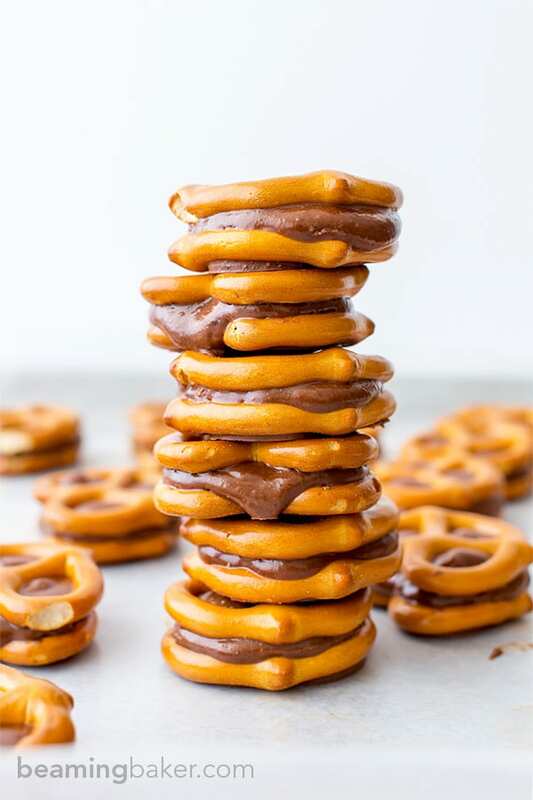 In a truly weird telepathic fashion, I had pretzels and nutella last night as a snack and today their healthier counterpart made their way to the interwebs 🙂 I’m a snack fiend too. You can never have too many snacks. I would also smuggle contraband snacks into the library in college. If we were lucky, we’d get a study room and close the door – people never heard my crunching and rustling, hah!! Have a fantastic rest of the week, Demeter!! Okay, but connection much? Lol. I’m always up for a weird telepathic fashion statement… or, wait what was I saying? 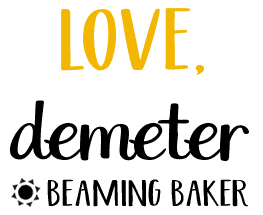 Remind me by beaming something to me! 😉 Haha. <--awkward humor alert. Oh, such a good idea on having a private study room! Then it'd be all out. Lol. Hope you have an amazing rest of the week as well. Thanks J! Swoon. Drool. These look fantastic! I can’t believe they’re vegan either and only 3 ingredients. That’s amazing. You make it look so fun and easy. Crunch crunch, that salty craving is coming on!!! These look amazing! 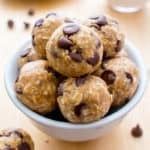 Love the combination with almond butter ! I’m in a constant need for snacks and I even skip meals at times, after having way too much snacks! Need to try gluten free pretzels! Pinned! these little bites look incredible! i just love how moorish and addictive these look. 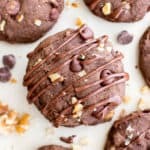 and the chocolate almond butter combination is just delicious! 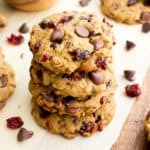 You can’t get any more simple and perfect than these bites! 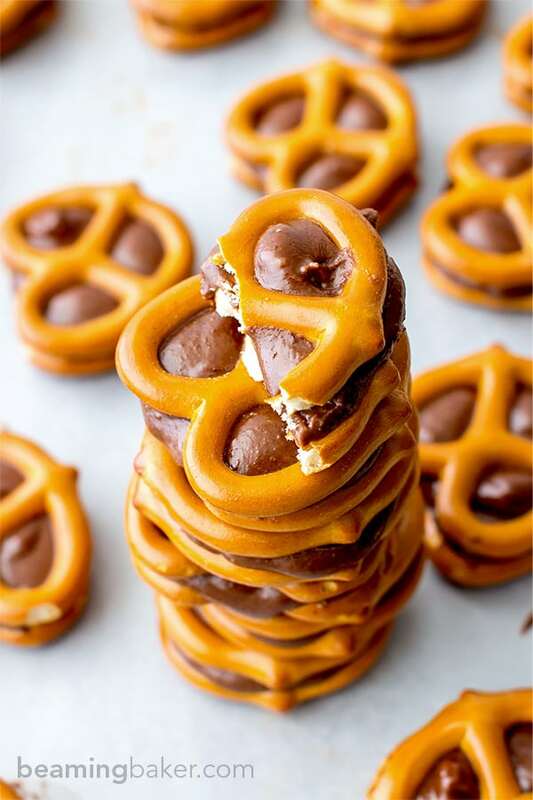 AB+chocolate + pretzel = sweet and salty delight! !